Fine dark chocolate buttons for cookies, icing, nibbles, and more. 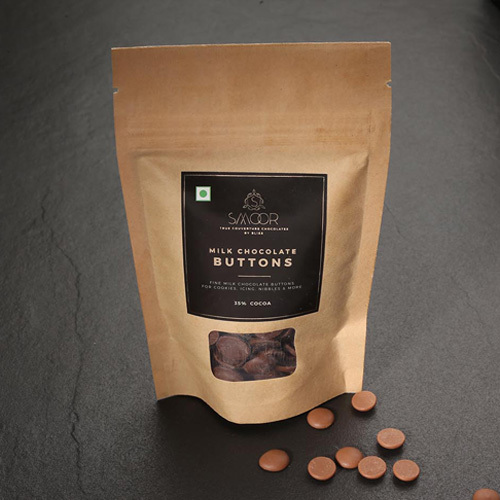 Extra Creamier, Extra Flavorsome Milk Chocolate Buttons from Smoor! Still baking with the same old ingredients? Discover an exclusive range of creamy milk chocolates at the online chocolate shop by Smoor. Milk chocolates are to bakers what spices are to chefs. With a one-of-its kind smooth texture and creamier tone, it delivers the quintessential chocolate flavor to brighten up every get-together. Be it baking, molding or a chocolate fountain, the milk chocolate buttons are designed to melt easily to fulfill multiple purposes. You can place an online order for Milk chocolates in Bangalore and across the country with our extremely efficient delivery process. Store these in your baking pantry to keep the last moment party jitters at bay. Smoor has forever been keeping up to its promise of delivering the most splendid quality of products for any occasion whatsoever. If you wish to make desserts which light up parties with a gorgeous appeal and delectable taste, Smoor’s got your back. Buying baking chocolate online in India, has never been more effortless. We continuously strive to make your online shopping experience the best it could be, so that we are the first to strike your mind, when the next celebration comes around.